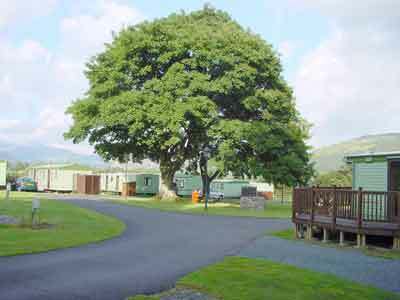 This Caravan Site is situated in an exceptionally beautiful position, on the historic Peniarth Estate, looking up towards the South face of Cader Idris in the Dysynni valley. It is about a mile and a half off the A493 main coast road from Tywyn to Dolgellau, 3 miles from Tywyn and 15 miles from Dolgellau, down a turning to the small village of Llanegryn. The site, which has recently been totally refurbished, is limited to only 25 caravans, and offers private salmon and sea trout fishing. The area is ideal for birdwatching and leisurely walks through the Dysynni Valley and surrounding Welsh countryside. It provides a welcome contrast to the hustle and bustle of city life. The popular seaside resorts of Tywyn and Aberdovey only a few miles away, offer both golfing and boating along with numerous other holiday activities. Peniarth Estate, which has been the home of my family since 1414, is an unusually quiet and unspoilt location from which to enjoy your holiday. I look forward to showing you round the site, if you give me a call on my private number 01654-710101 or mobile 0831-131 000. Such an unusual site does need to be visited to be appreciated. I hope you will be able to find the time.